The Concerto for Group and Orchestra is a concerto composed by Jon Lord, with lyrics written by Ian Gillan. 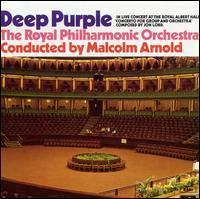 It was first performed by Deep Purple and The Royal Philharmonic Orchestra conducted by Malcolm Arnold on 24 September 1969 and released on vinyl in December 1969. The release was the first Deep Purple album to feature Ian Gillan on vocals and Roger Glover on bass. After the score was lost in 1970, it was performed again in 1999 with a recreated score.